The prize for February is a set of my Edinburgh coasters. February 4th WhereArtI answer: This is the clock tower of Donaldson’s School building in West Coates, from a detailed commission I was working on in December. Niamh Crimmins was randomly picked from the correct answers to go into this month’s prize draw. Thanks for playing, more next Monday. Hello Morag, I am so glad you are happy with your drawing!! 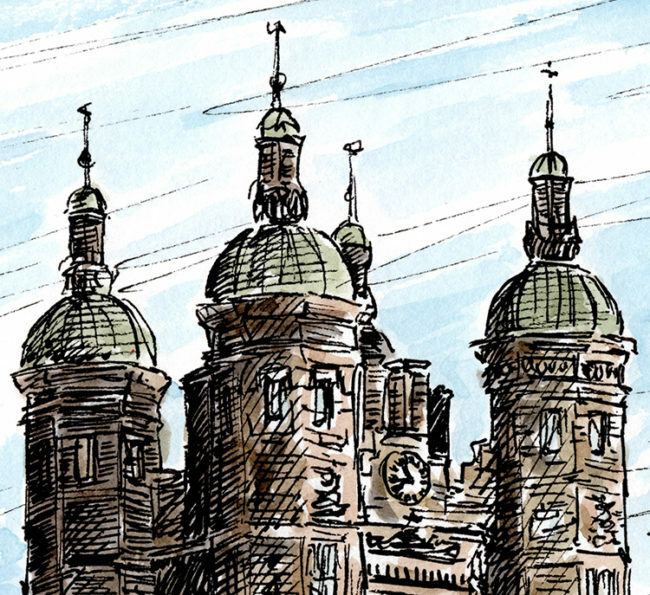 It’s the clock tower of The Playfair at Donaldson’s, formerly Donaldson’s School – we have your fabulous original drawing on our wall as it was a Christmas present! Donaldson’s School for the Deaf/Orphan hospital, West Coates, Edinburgh?!?! Donaldson’s school for deaf people (Linlithgow). The former Donaldson’s School for the deaf (now The Playfair at Donaldson’s I believe) at Easter Coates. This is the as once was Donaldson School. This is an easy one even for me, tho my first thought was George Heriot’s, however the clue gives it away – It is the central clock tower over entrance to the former Donaldson’s school. A beautiful building always to marvel at as one walks along Roseburn Terrace to Murrayfield stadium. Donaldson’s school for the deaf. No wonder it looked very familiar as you see this every time you walk to and fro to arrive at Murrayfield! Donaldson’s School on the Glasgow Road. It’s used-to-be-Donaldson’s School on West Coates.